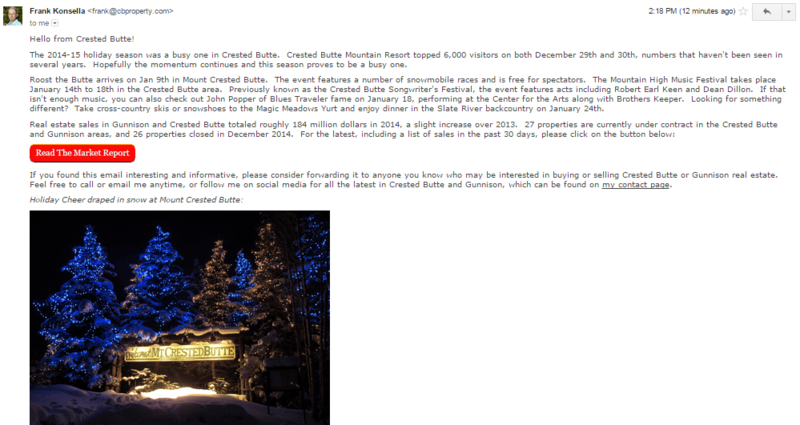 Would you like to receive a Crested Butte real estate newsletter once a month? Sign up is easy- just add your name and email address in the boxes. My monthly real estate newsletters contain Crested Butte Market Analysis and information with area sales figures and trends, plus recently sold property data, so you’ll know when your neighbor’s home sold and how much it sold for. Your information is safe with me, and it’s easy to opt out of the emails if at any time you decide you would no longer like to receive them. Additionally, the newsletters keep you up to date on what’s happening in the Crested Butte and Gunnison areas. This includes information on upcoming events, the state of the local economy, and everything else to keep you “in the know” in the Gunnison country. Do you know the type of property you’re looking for? Whether you’re looking for a condo in a specific building, or vacant land in your favorite subdivision, or a far more general search in any price range, it’s easy to set up listing alerts. You’ll know as soon as new properties hit the market, so when that perfect property pops up, you’ll know about it. Or, if you prefer, contact me and I’ll keep my eyes out for you. Sign up for my newsletters. Stay in touch with your favorite place- with the latest news, events, and market stats. Signature Properties Ebner and Associates, is independently owned. Signature Properties Ebner and Associates is an Equal Opportunity Employer and supports the Fair Housing Act.